Henry Ford once said of his cars: ''You can have one in any colour, as long as it is black.'' Thank the Lord he didn't breed racehorses! Where would we have been without ''Dessie''? It is difficult to put a finger on it, but there is something special about grey horses. Even from afar they eclipse the bays, chestnuts and their like. Lady luck invites us to bet on the grey. No one asks: ''Which one's mine?'' And when they win... it's like watching Pegasus without wings. You know, I believe one grey horse was truly magical. Why? Because if you ask someone to name a grey I bet they will give one reply. Such elegance, beauty, captured in a gritty determined winning style. I'm convinced he was born a unicorn but some vagabond stole his magical horn leaving him with a story which foretold one day you will run like the wind, fly over fences and be crowned a champion racehorse. 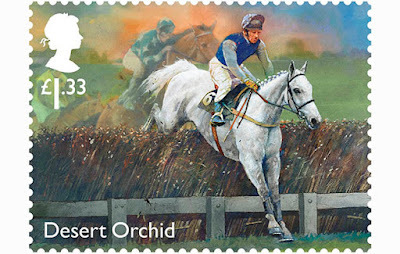 His name was Desert Orchid. Born on the 11th April 1979, this son of Grey Desire, out of the mare Flower Child, became an icon of National Hunt racing. With his front-running style and iron will this much-loved horse was simply the peoples' champion. His greatest victory came in the 1989 Cheltenham Gold Cup. Desert Orchid, trained by David Elsworth and ridden by Simon Sherwood, had been in superb form leading up to this race where he was made 5/2f. Running over 3m 2f, jumping 19 fences in heavy ground, would be a remarkable test for a horse who was once thought a two-miler at a course he did not favour. This noble grey jumped well, leading to the 14th fence, he was left in the lead 3 out, only to be headed by the brave mud-loving Yahoo. Over the last fence it looked as though Desert Orchid was beaten. The crowd watched in awe as racing commentator Peter O'Sullivan echoed those famous words: ''Desert Orchid is beginning to get up.'' He won by one and half lengths beating Yahoo, with Charter Party finishing third. Simon Sherwood said: ''I have never known a horse so brave. He hated every step of the way in the ground and dug as deep as he could possibly go.'' Dessie was without question the peoples' champion. A quote from a race fan remembering this day detailed what so many felt. Few race meetings capture the anticipation, excitement and passion of the Cheltenham Festival. The Gold Cup the pinnacle of equine star. Which horse captures your imagination like Dessie? What's your idea of a good horse racing bet? Bring sports alive with the best odds available at Bet Victor.